(TibetanReview.net, Aug28, 2014) –China has made it compulsory for Tibetans to turn out in large numbers to greet a monk it has designated as the 11th Panchen Lama, Tibet’s second most prominent religious figure, as he visits the region even though most Tibetans don’t accept him as the legitimate reincarnation of the 10th Panchen Lama. Swift punishment has been warned against those disobeying the order, reported Radio Free Asia (Washington) Aug 26. “They were warned that if they failed to show up to receive him, they would be punished for committing a political error,” the report quoted a local source as saying. Monks were ordered to be on their best behaviour during the visit. The authorities were reported to have noted down the mobile numbers and identity cards of those assigned to greet him. “Those not designated to see the Panchen were ordered to stay at home and were forbidden from looking out of their windows or from gathering on the rooftops or sidewalks,” the source was further quoted as saying. Warnings were issued of swift punishment of anyone disobeying the order. Monasteries placed on Gyaincain Norbu’s itinerary were reported to have been given grants of 150,000 yuan (US$ 24,360) each to prepare the receptions, with the money going mainly for the construction of thrones, purchase of religious items, and for carrying out cleaning up works. Gyaincain Norbu, now in his mid-20s and resident of Beijing, was accompanied by armed police and public security officers, along with a party of 30 monks besides Chen Qianguo, the regional secretary of the ruling Chinese Communist Party, and other officials as he toured monasteries in Namling (Chinese: Nanmulin) County of Shigatse Prefecture, Tibet Autonomous Region. 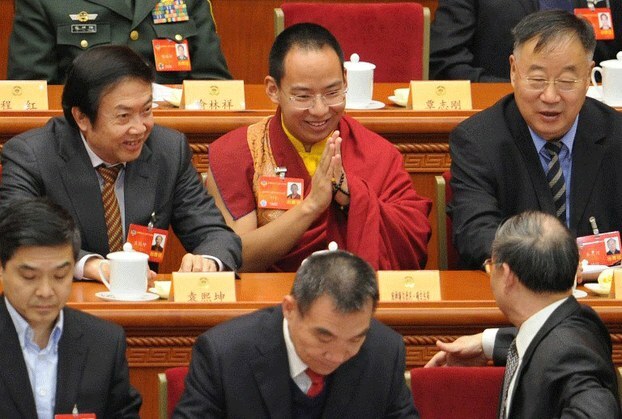 Atheist China named Gyaincain Norbu as the reincarnation of the 10th Panchen Lama in 1995 as a deliberate rebuff against Tibet’s exiled spiritual leader, the Dalai Lama, who had formally recognized six-year-old Gedhun Choekyi Nyima as the 11th Panchen Lama. Gyaincain Norbu made his political debut in May 2010 at the annual session of the Chinese People’s Political Consultative Conference (CPPCC) in Beijing, appearing as a national committee member of China’s top but only a rubber-stamp political advisory body. He has since been made a vice-president of China’s state-run Buddhist Association. Meanwhile the boy recogized by the Dalai Lama continues to remain disappeared ever since the Chinese government took him and his family away in 1995.